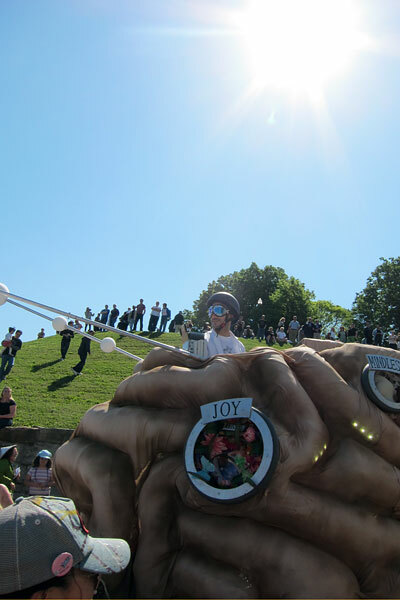 With more sculptures than ever before, more spectators than ever before, and more volunteers than ever before, this was a great race! 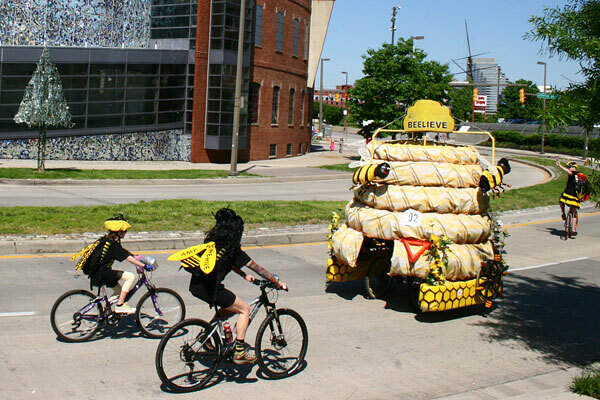 With 33 sculptures from 26 teams, there were bound to be curious coincidences: this year we had two teams of bees and two teams of cats. 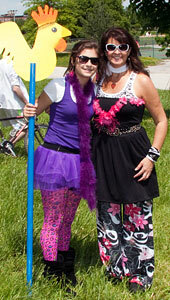 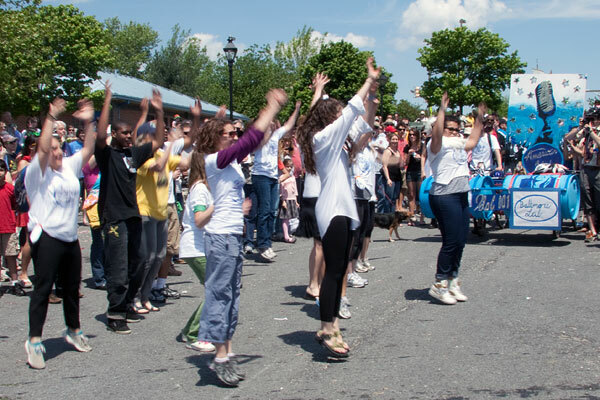 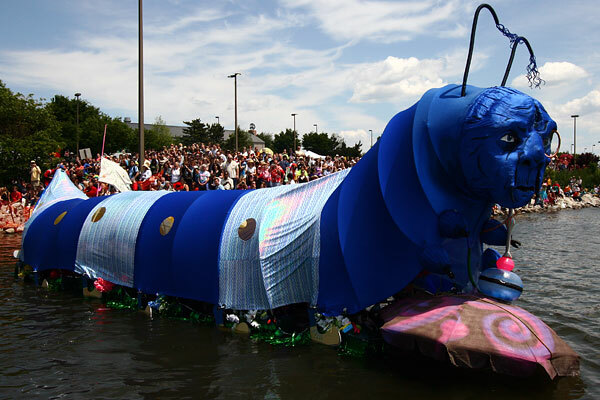 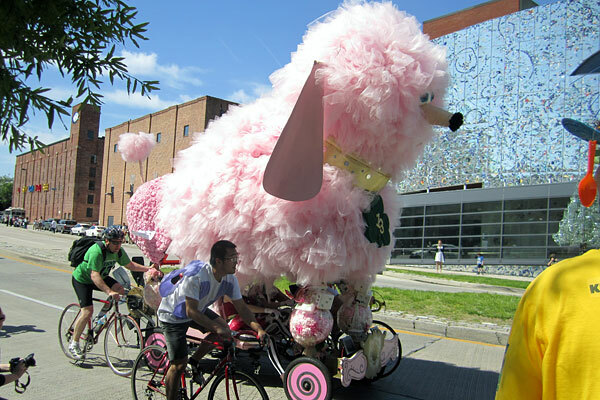 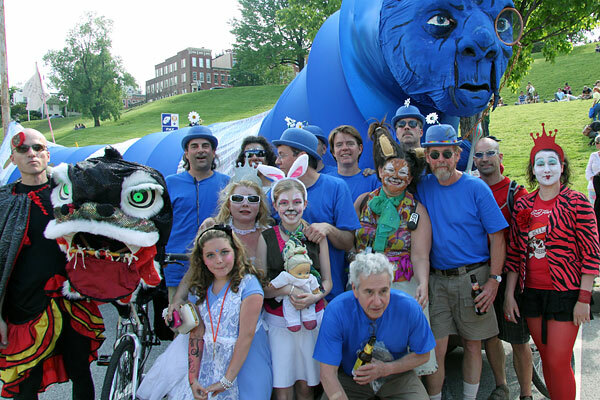 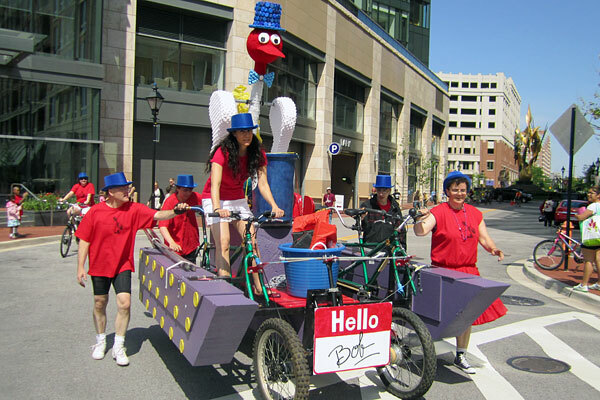 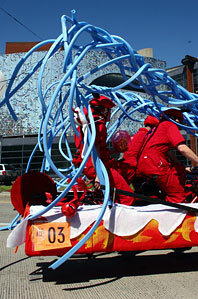 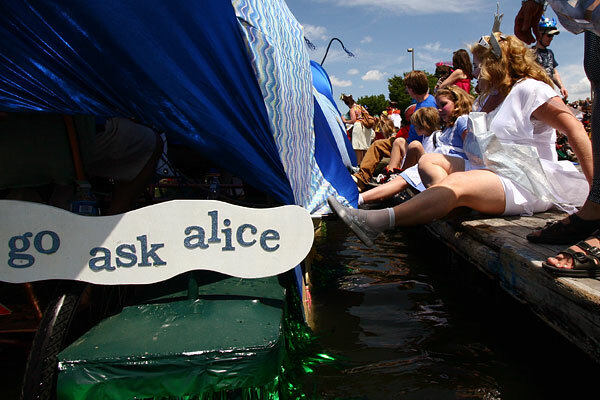 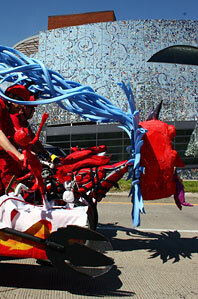 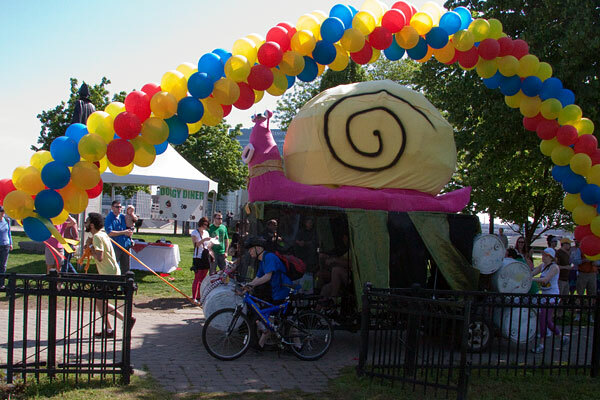 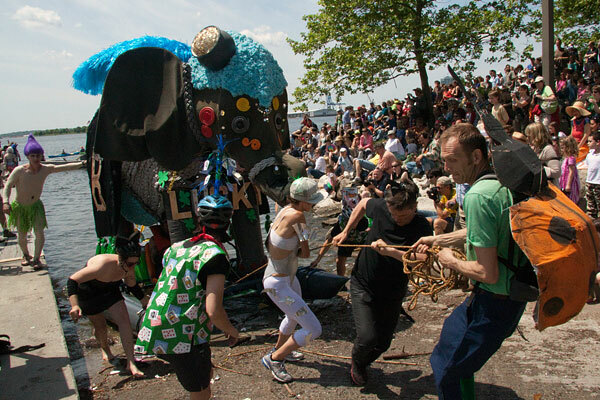 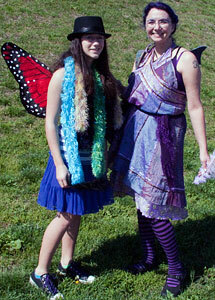 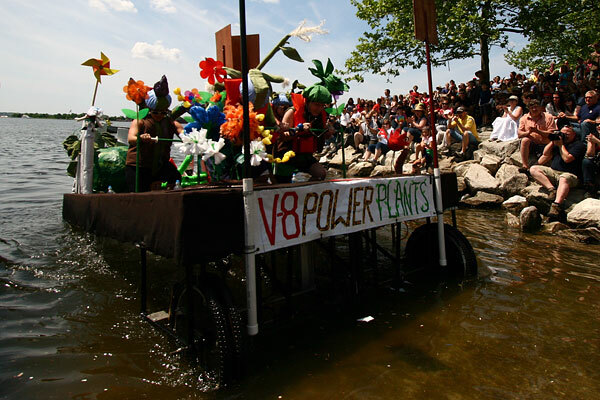 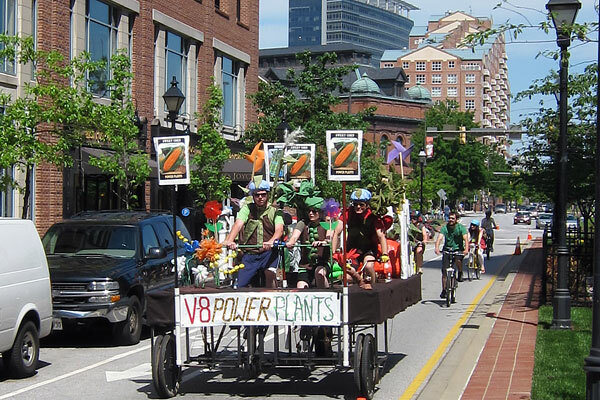 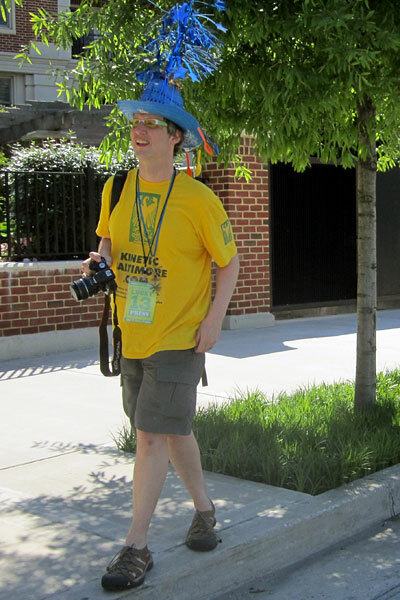 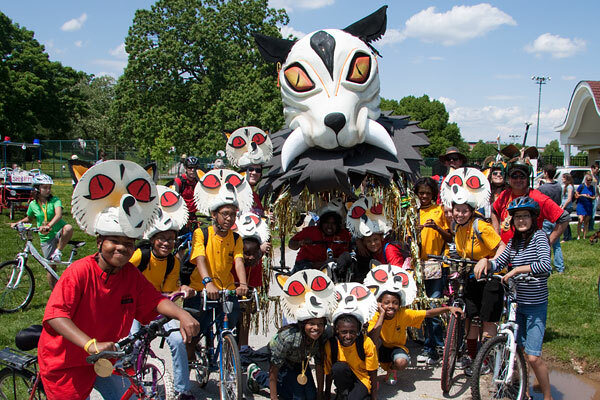 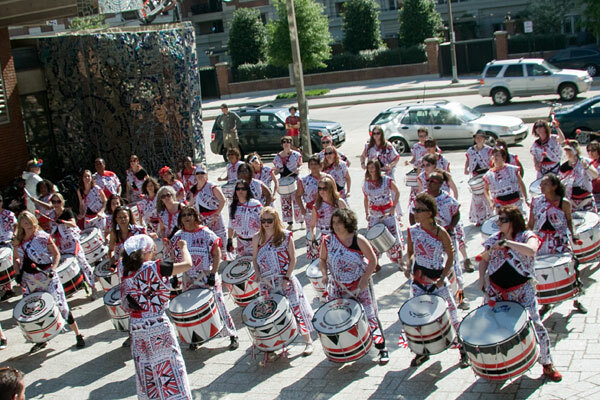 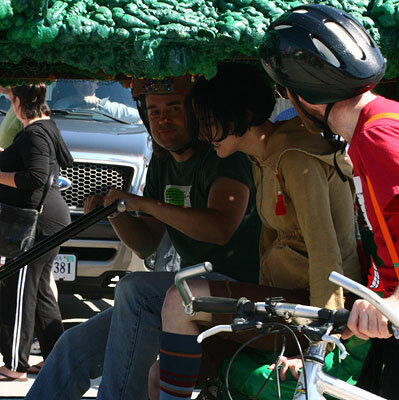 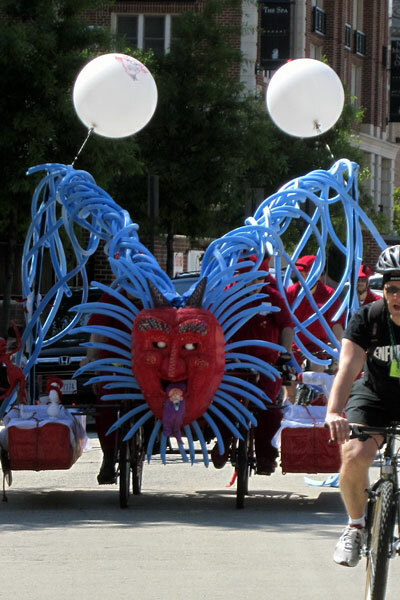 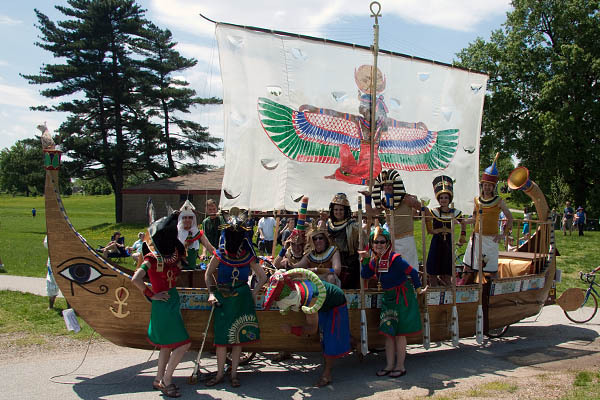 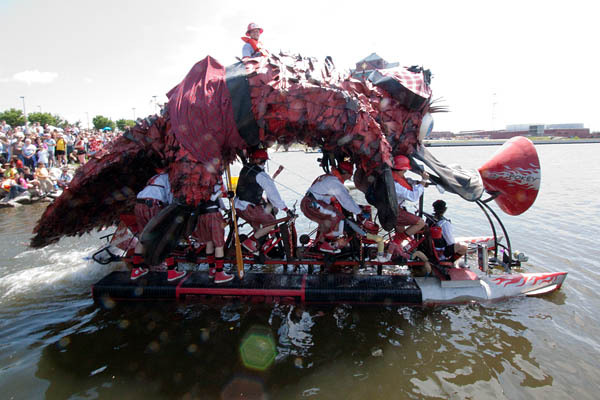 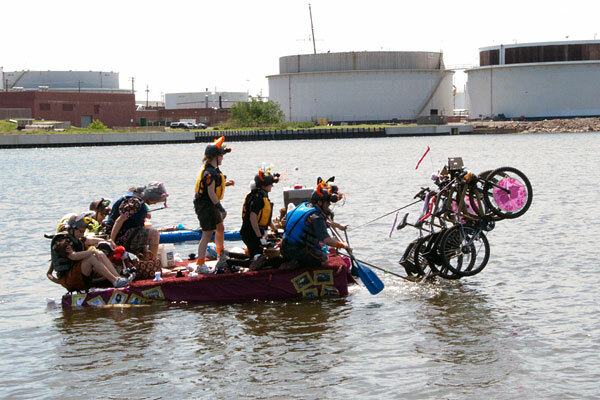 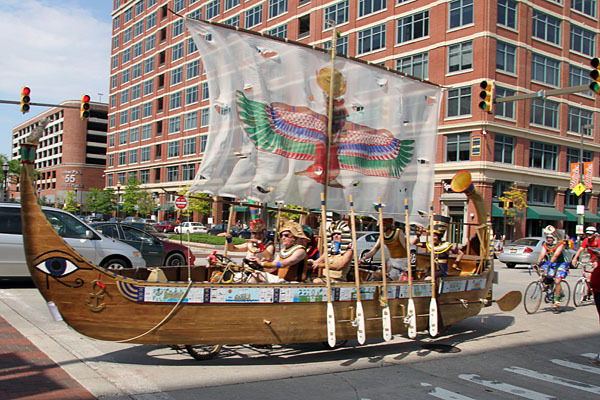 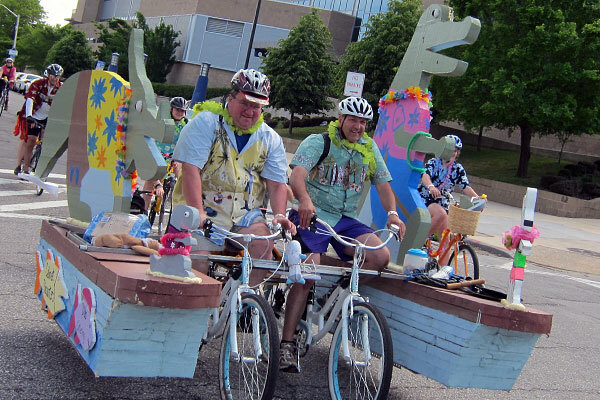 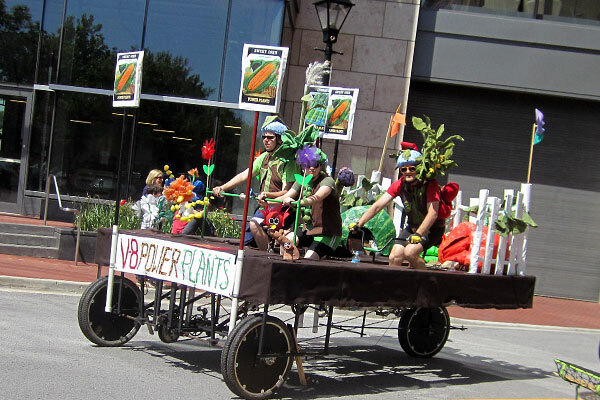 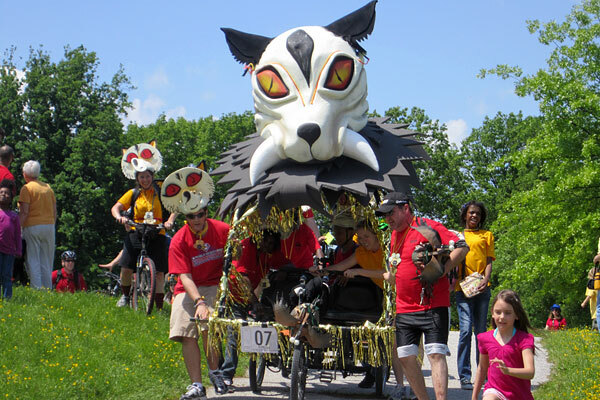 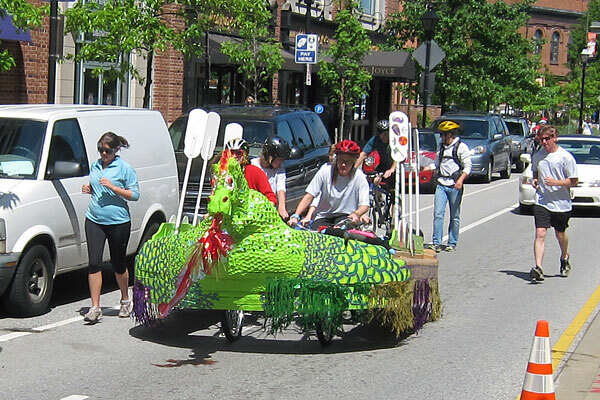 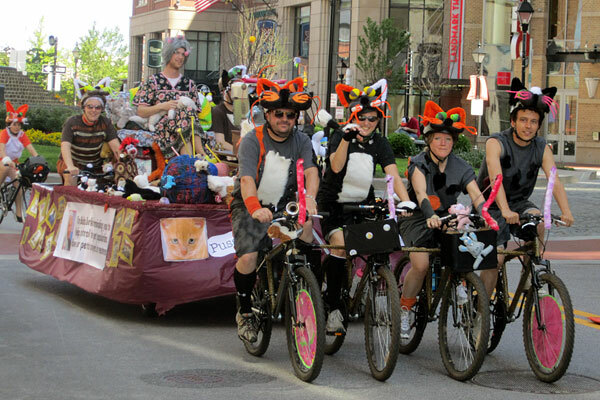 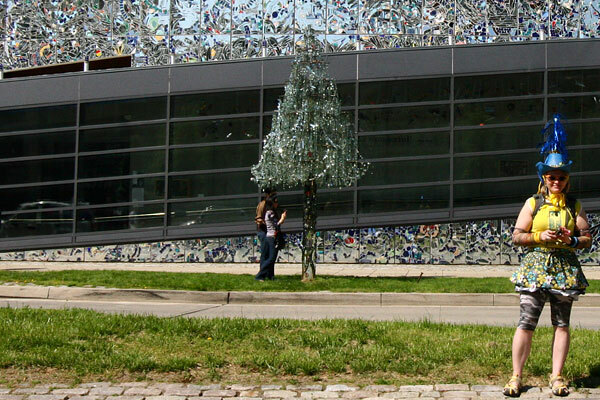 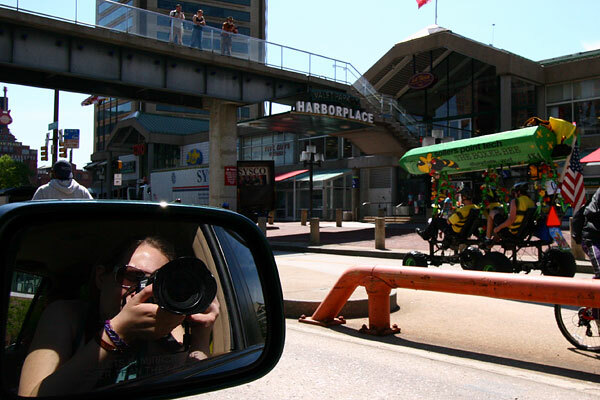 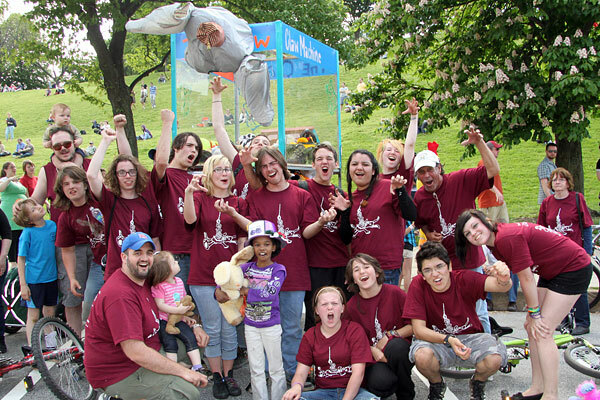 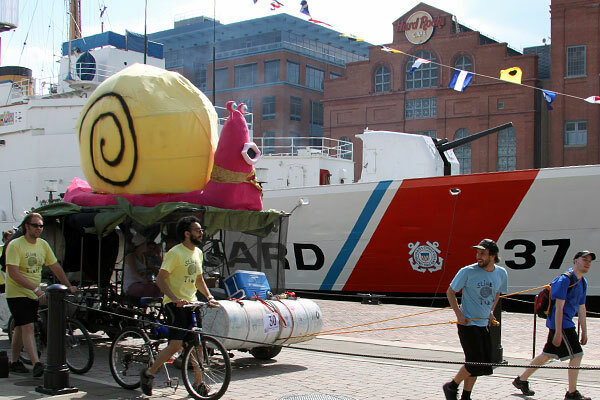 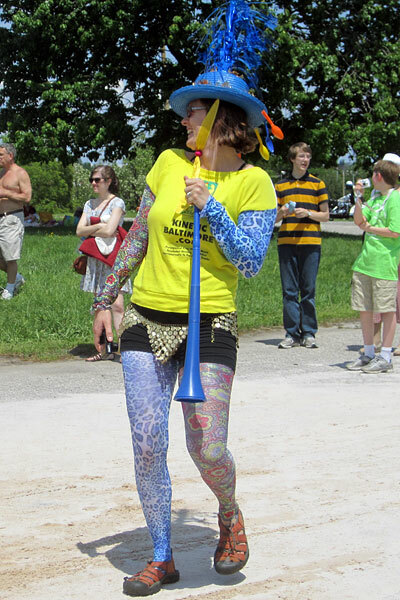 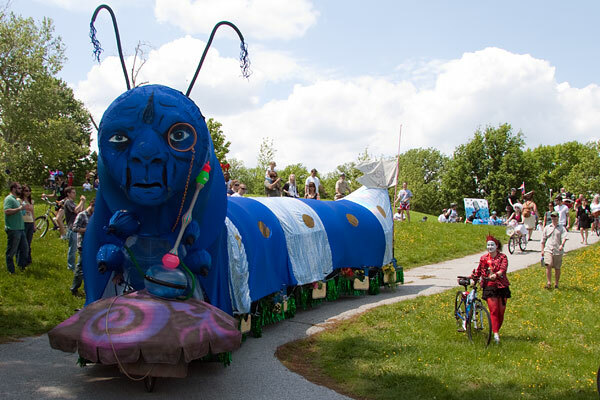 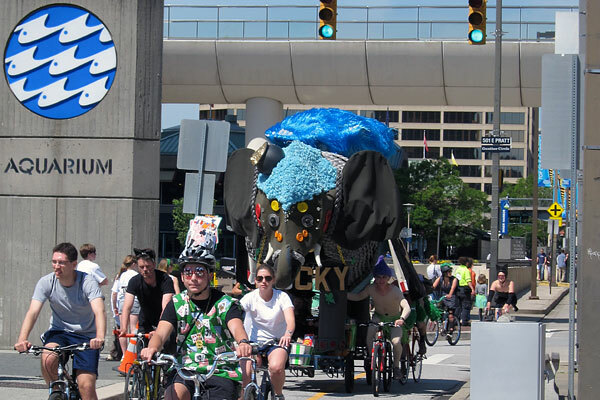 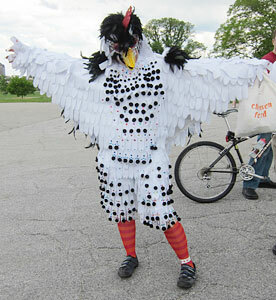 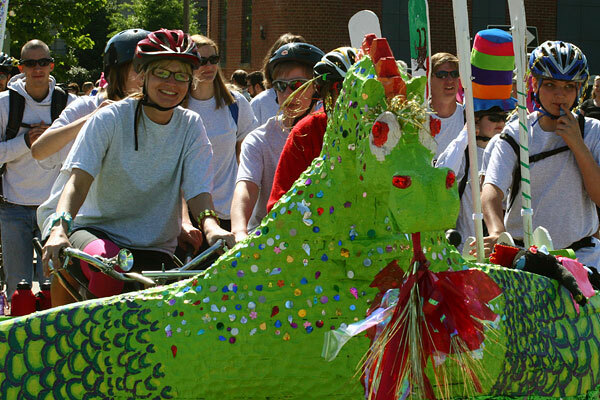 Thanks to a dedicated corps of volunteers and hard work by the staff of the American Visionary Art Museum, 2011 also made major advances coordinating and managing this extraordinarily complex and chaotic event through 15 miles in 11 neighborhoods over 7 hours. 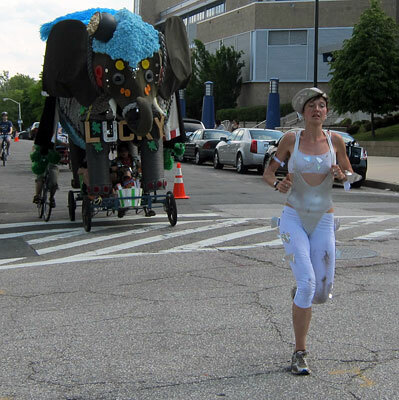 To see others’ coverage of the race, or to tell others of your race experiences, be sure to check out the Kinetic Forum. 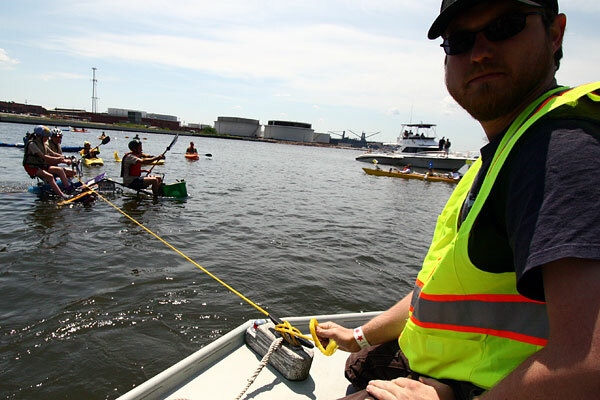 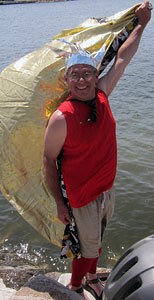 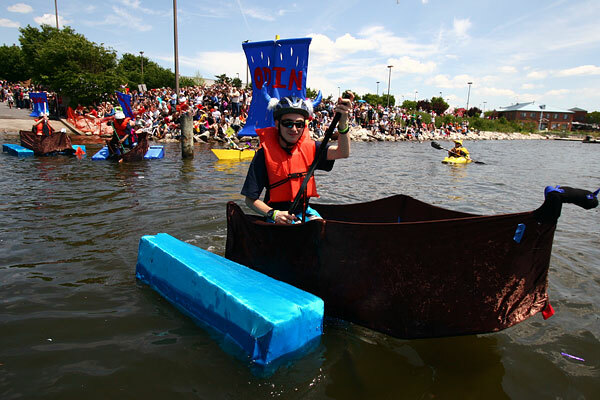 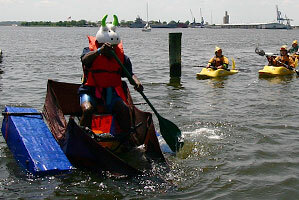 David Hess’ magnificient PLATYPUS (Personal Long-range All-Terrain Yacht Proven Un-Safe) finally received the 2011 Grand Mediocre East Coast Championship trophy for his seventh year in the race. 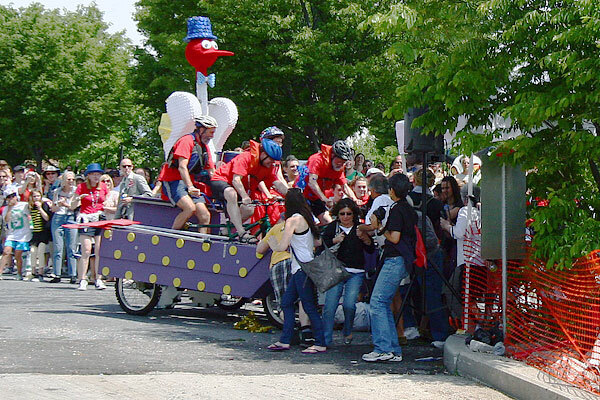 Fully loaded with his eight pedalling pilots, plus one barnacle steering and an optional barnacle aloft, Pokey weighs roughly two tons, yet is propelled along the 15-mile racecourse entirely by those eight pedallers. 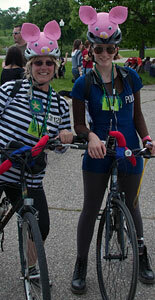 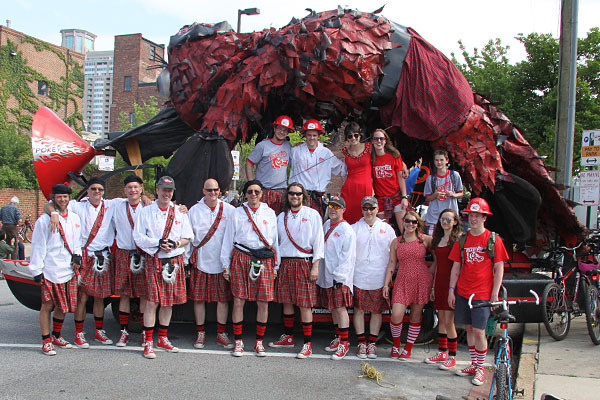 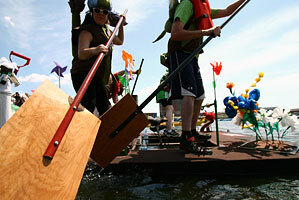 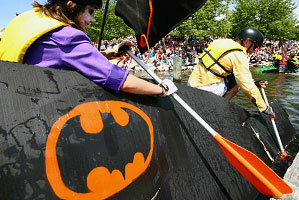 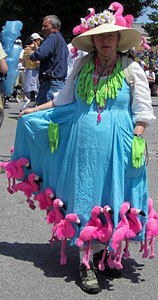 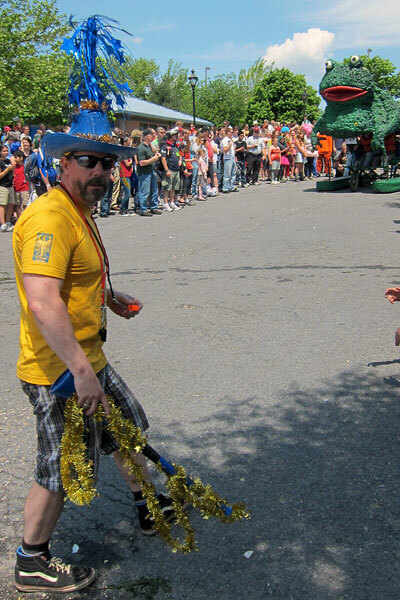 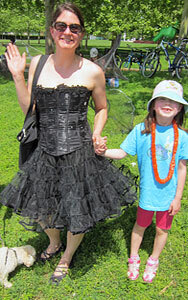 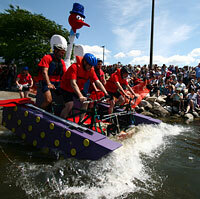 This year, the PLATYPUS sported a Scottish theme, with tam o'shanters and kilts. 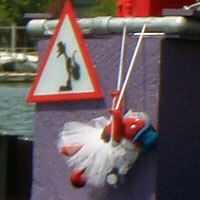 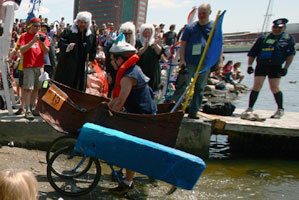 On the water, PLATYPUS switched to paddlewheel drive and cruised magnificiently on their pontoons. 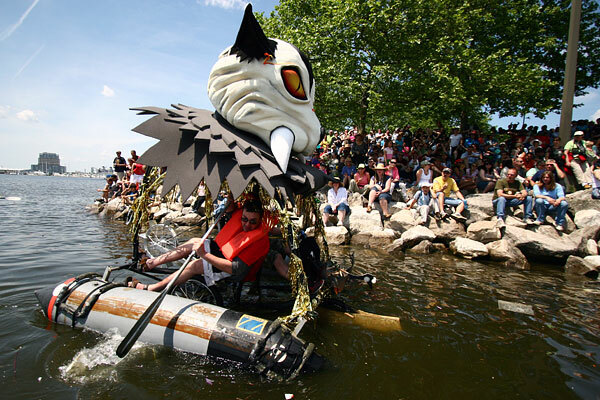 Pokey has never entered the ACE level of competition, but instead demonstrates engineering prowess through sheer capability. 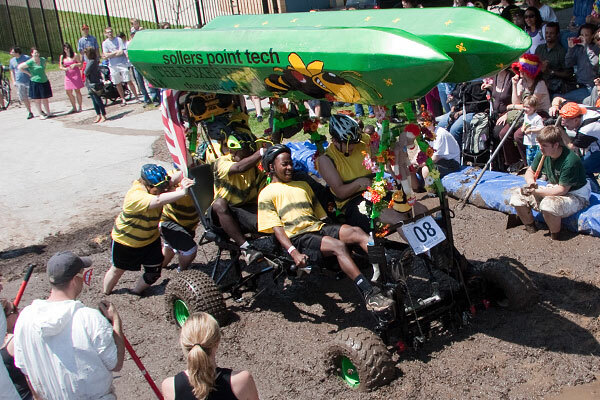 When Pokey last year encountered the mud—the most difficult in east-cost Kinetic history—Pokey’s pit crew sullied themselves heaving him through. 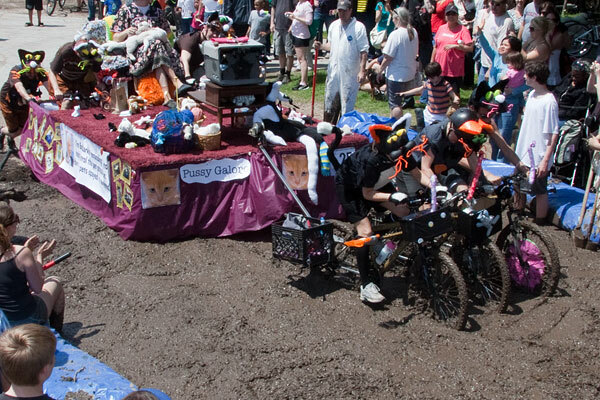 They were prepared for mud that rough this year when the pilot leapt forward out of the steering seat and operated a hand-crank winch which would have pulled Pokey through the thickest mud. 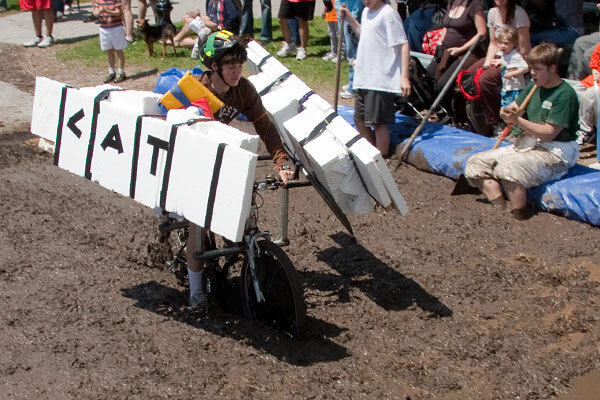 This year’s mud wasn’t the viscous shoetrap it was last year, and seemed rather shorter, so Pokey had no difficulty pulling through. 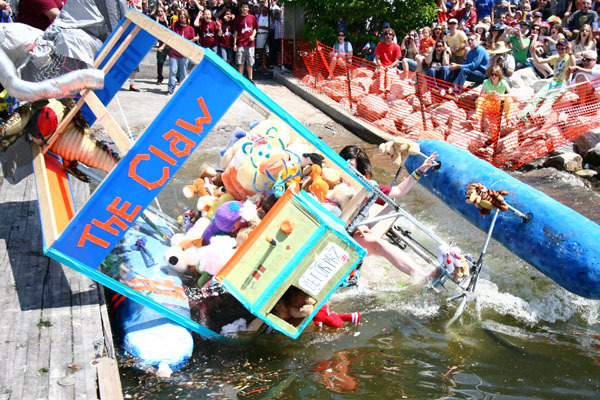 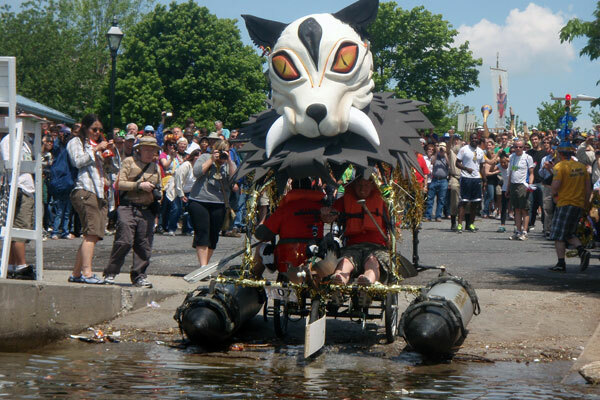 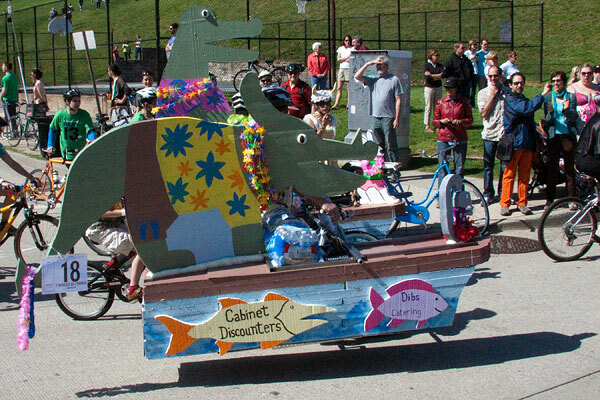 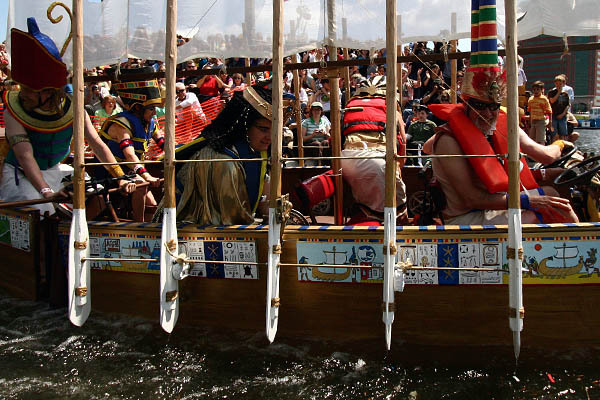 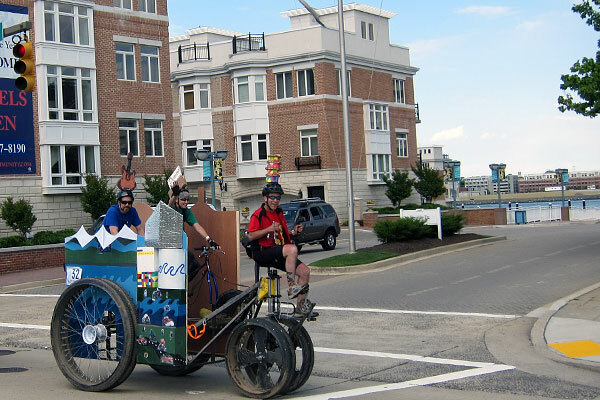 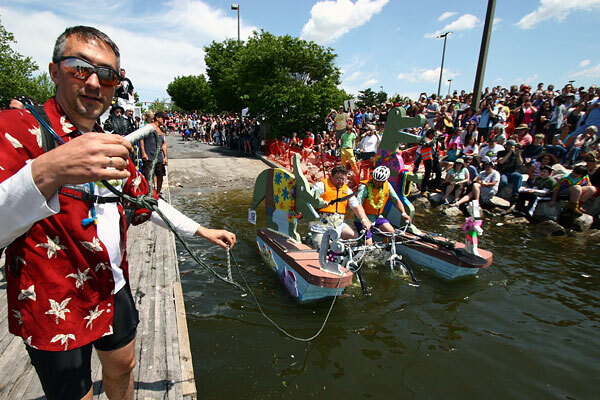 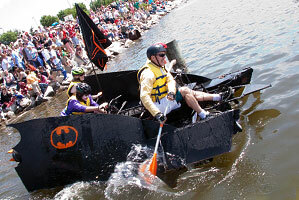 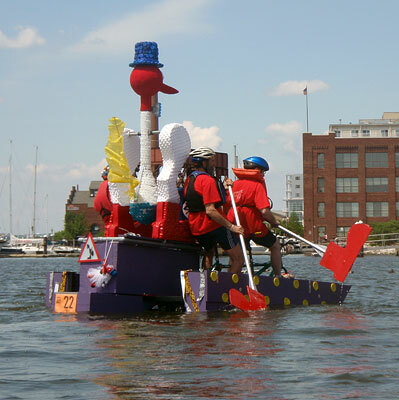 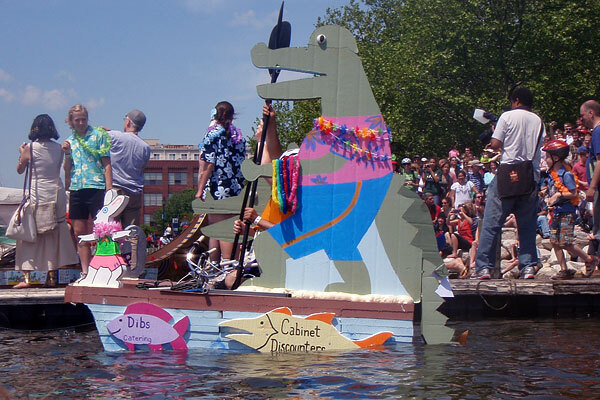 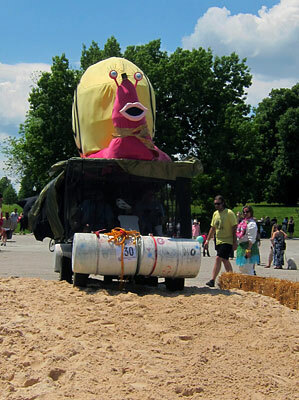 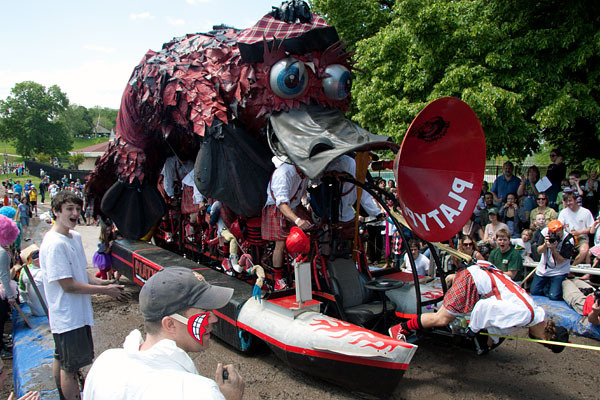 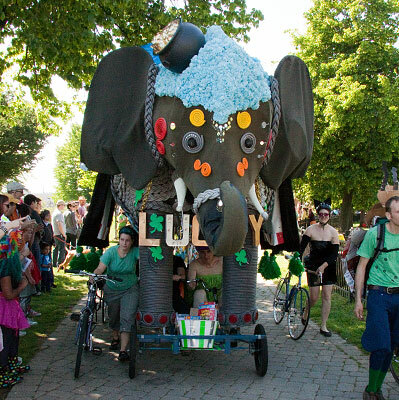 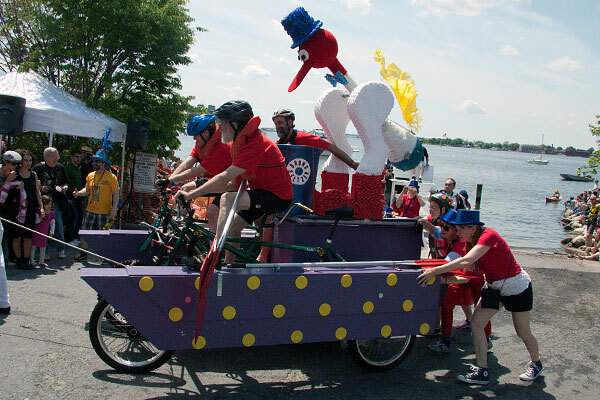 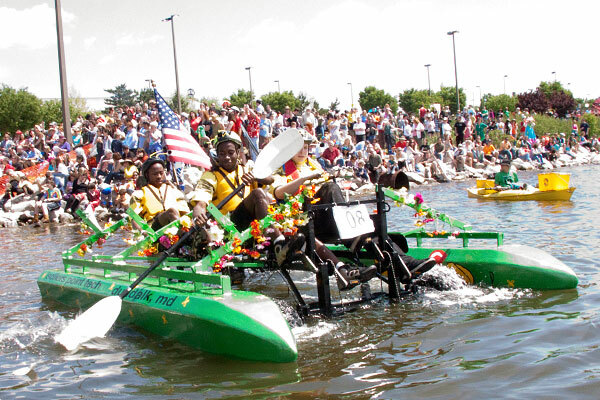 As Champion of the East Coast 15-mile race, the PLATYPUS is eligible for the 42-mile World Kinetic Sculpture Championship over Memorial Day weekend in Humboldt County, California. 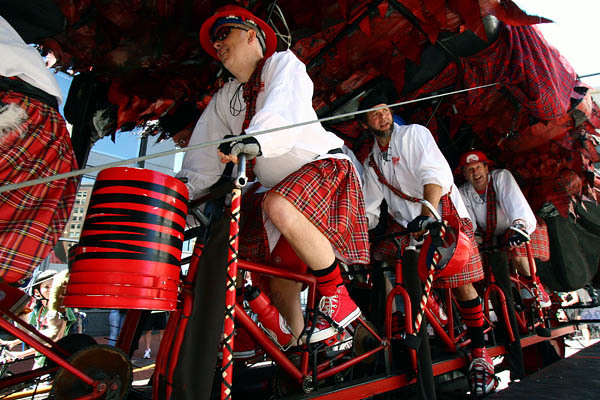 While each of Pokey’s pilots pedals an individual bicycle chassis, the chains combine their energy in a transmission from a Suzuki SUV. 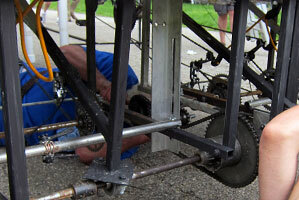 From that point, the drivetrain, wheels, and tires are all automotive components. 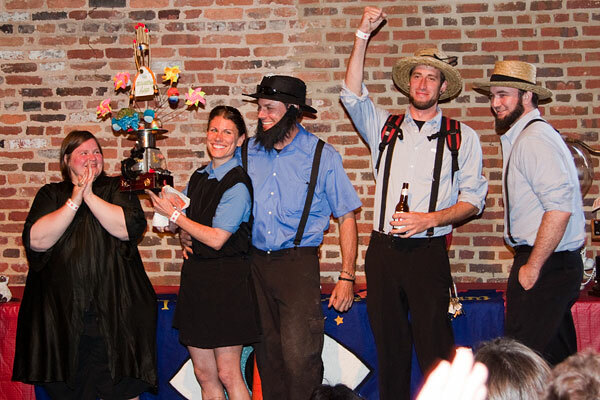 Captain Hess raises his hand triumphantly as the team receives its championship trophy—topped by gold-plated bicycle handlebars—at the awards ceremony. 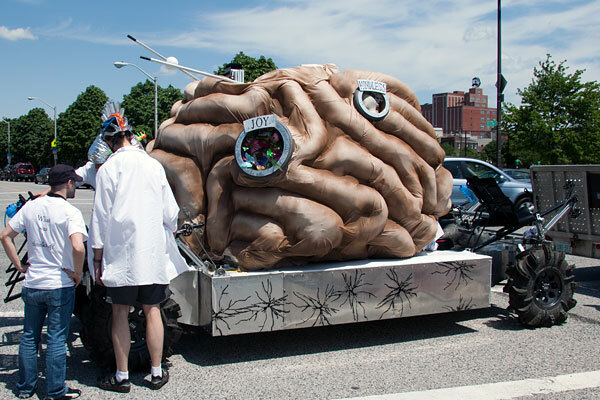 The Janelia Farm campus of the Howard Hughes Medical Institute in Ashburn pooled their scientific minds to create the spectacular Lobe Trotters colossal all-terrain brain. 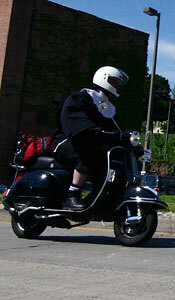 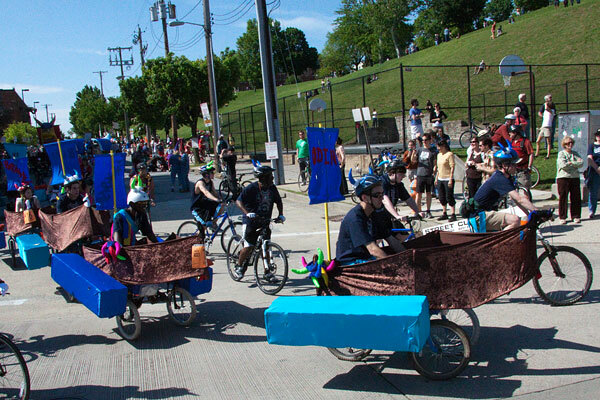 But as they crested Federal Hill, one of their two motorcycle power chains severed under the load, and the Lobe suffered a seizure. 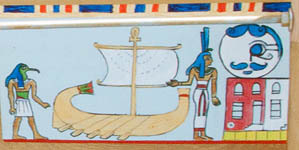 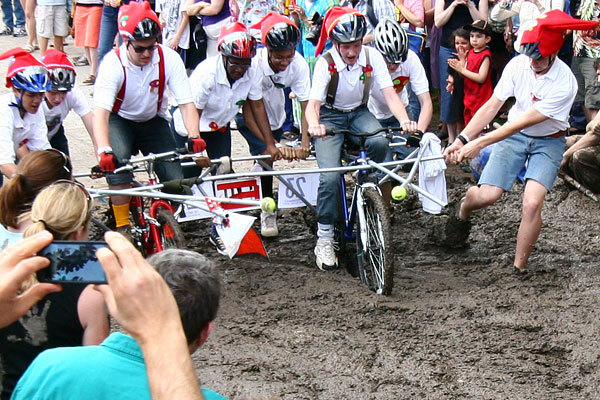 Without tools to break and repair the chain, its terrestrial progress for the rest of the race depended upon being pushed by its crew. 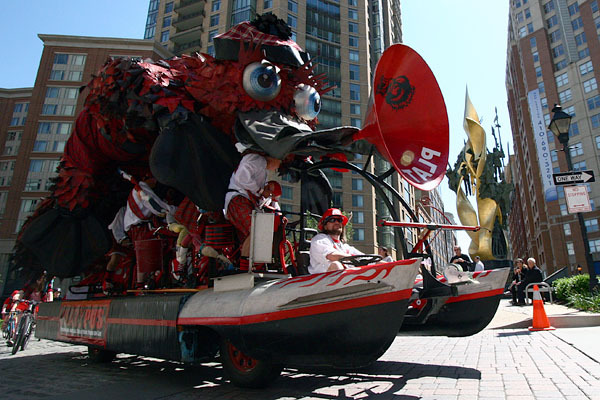 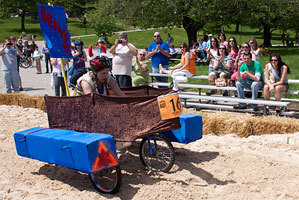 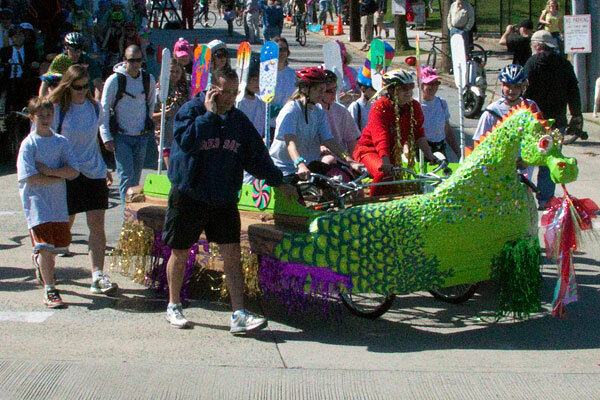 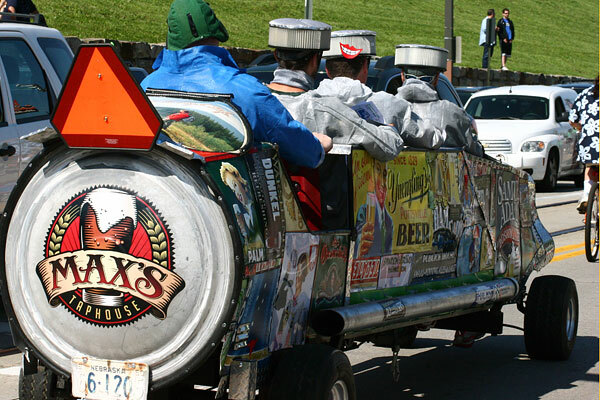 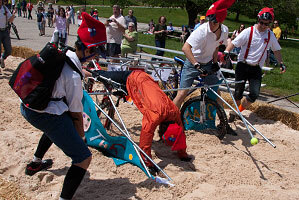 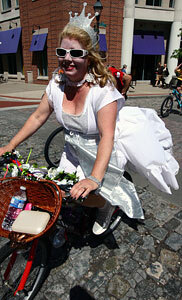 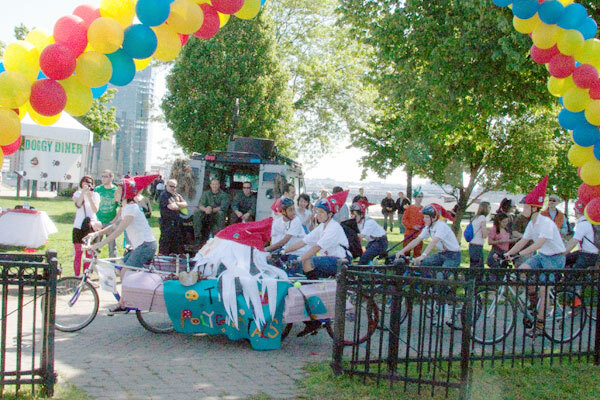 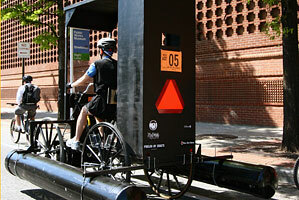 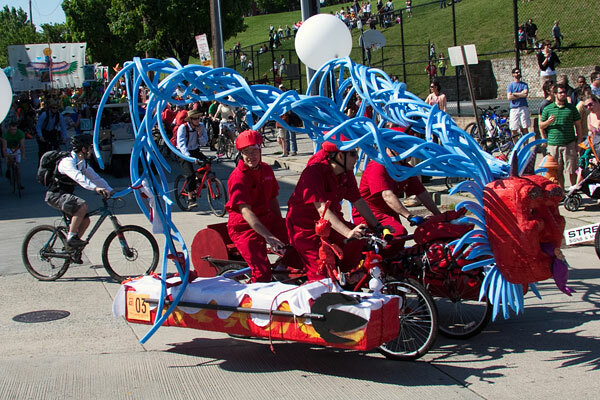 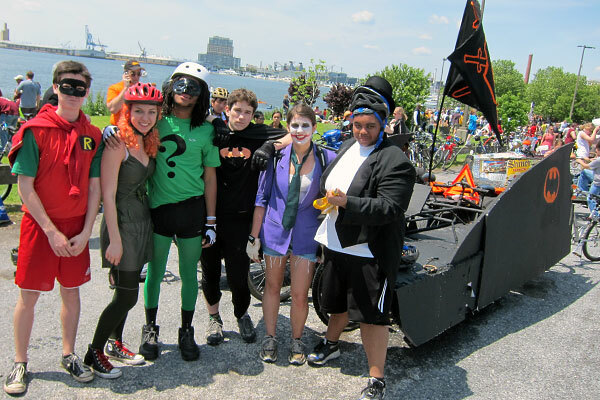 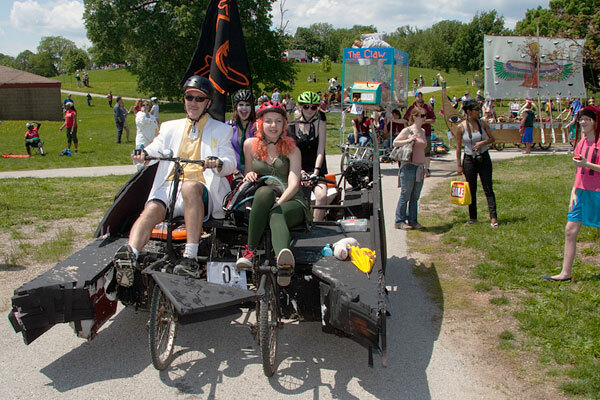 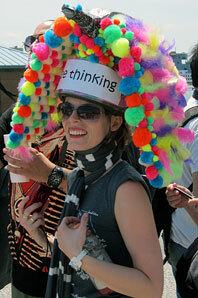 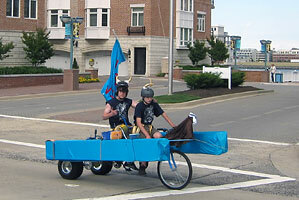 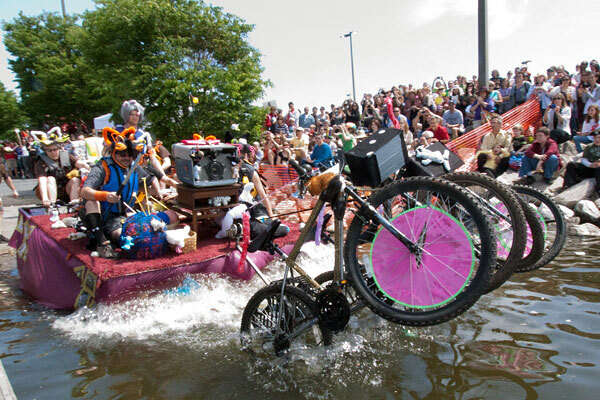 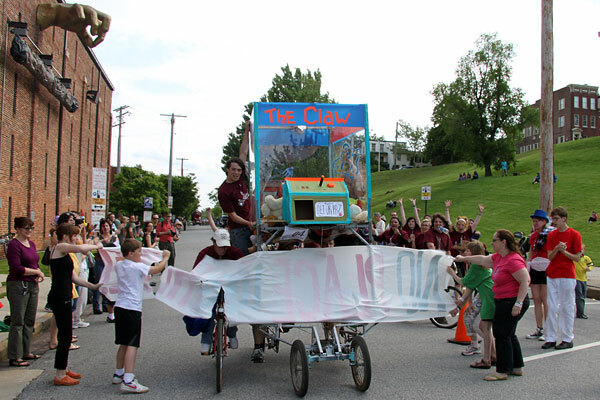 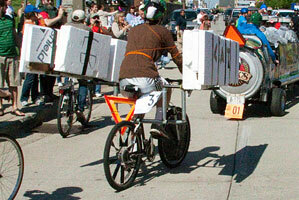 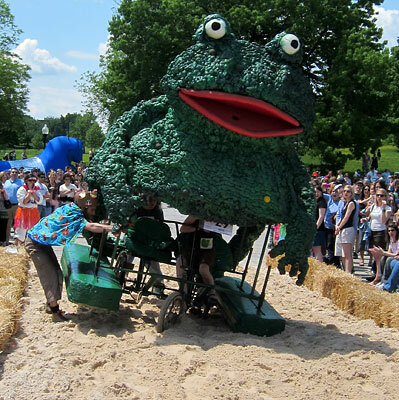 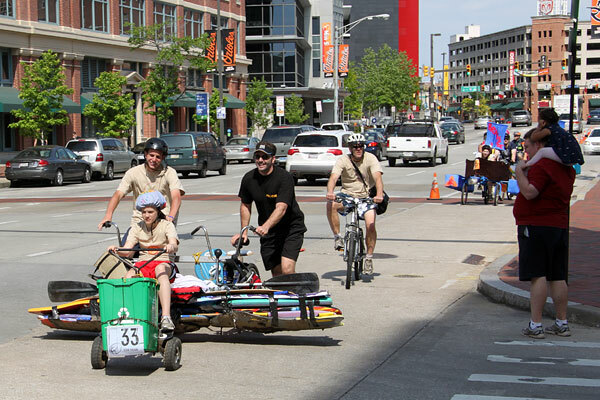 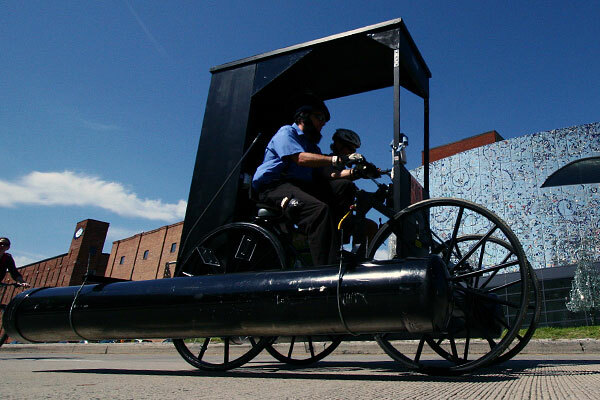 Kinetic races have seen the failure of many a bicycle chain1 stressed beyond its capacity. 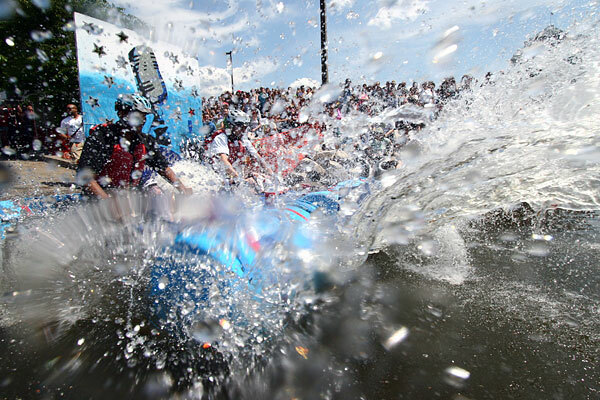 However, we’ve never seen any other instance in which a motorcycle chain2 has failed. 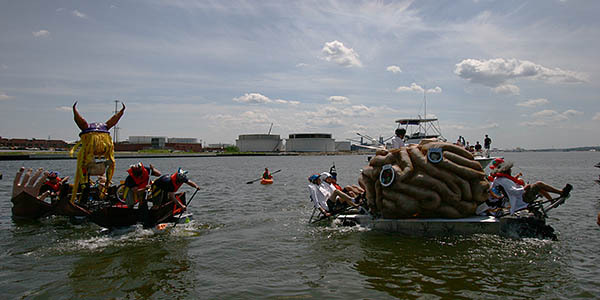 This photo shows after they had trailered the Lobe to the water entry, under the distant watchful eye atop the National Bohemian building. 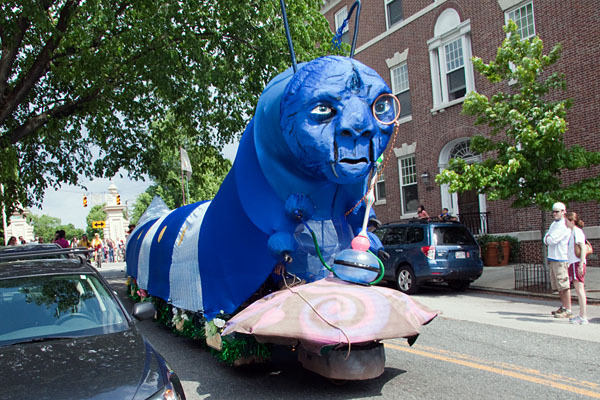 Due to this surprising failure, they received the Worst Honorable Mention, given in this case for a design that should have done better. 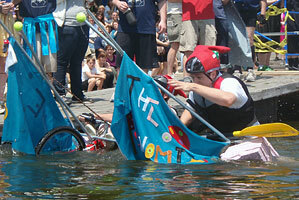 On the water, the Lobe was superb and swift. 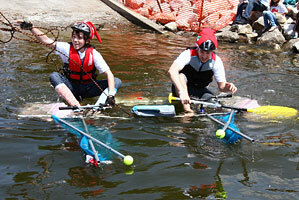 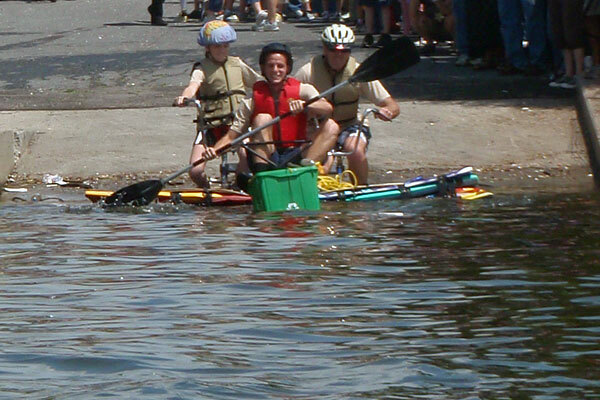 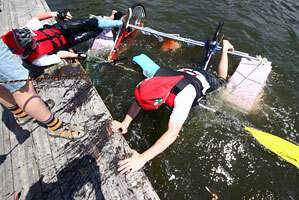 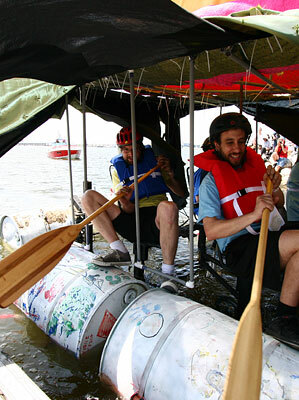 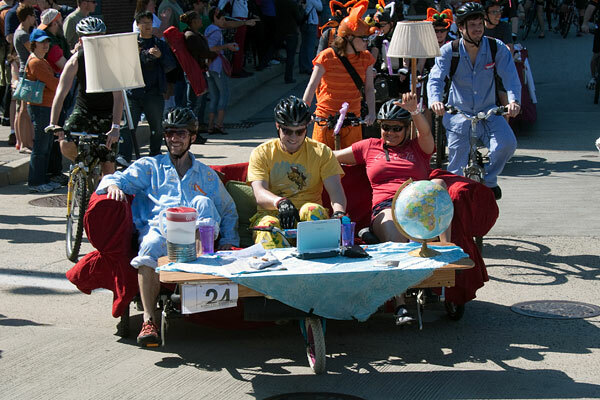 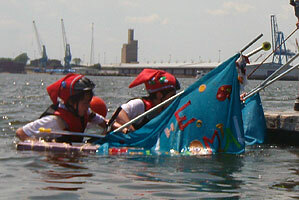 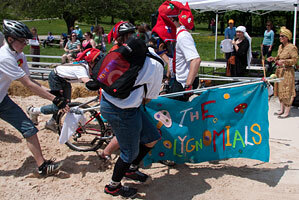 The recumbent Lobe pilots easily passed other teams stooped over with oars. 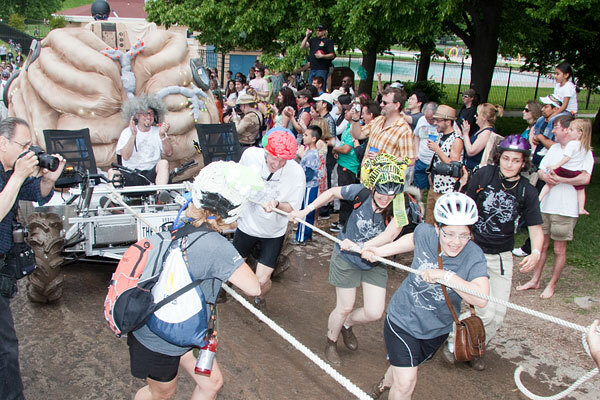 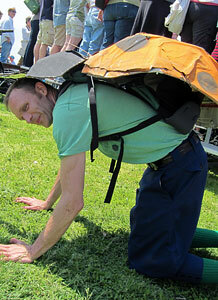 The Trotters pushed the Lobe throught the knolls of Patterson Park to reach the sand and mud. 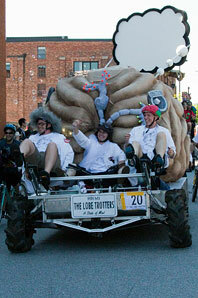 With a tow crew, the Lobe made it through the mud. 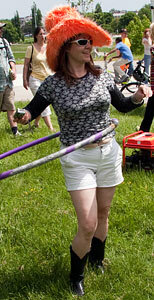 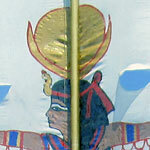 Portals into the brain demonstrated some of its functions. 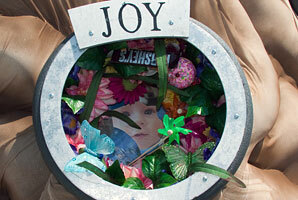 Note that a chocolate bar appears in both “joy” and “addiction”. 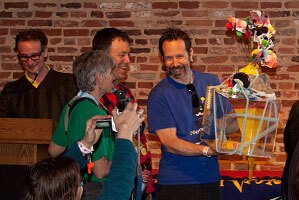 Here they proudly receive their trophy at the awards ceremony. 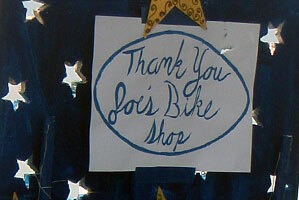 We hope they repair the chain and come back with Lobe 2.0 in 2012. 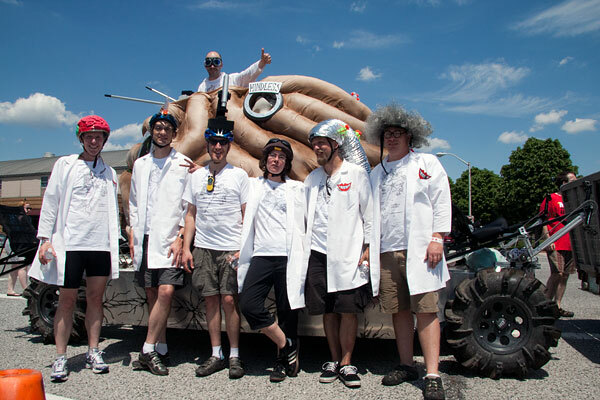 Crew costumes were lab coats and an unusual array of scientific headgear, including a helmet-mounted microscope made of foam. 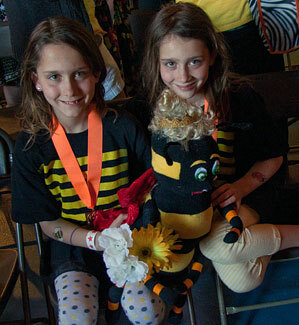 See their article and a fabulous video at the HHMI Bulletin. 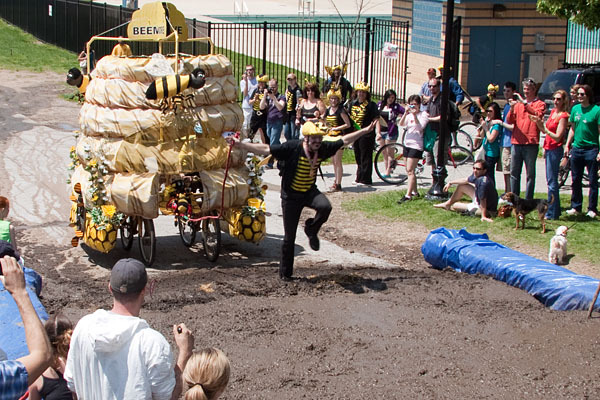 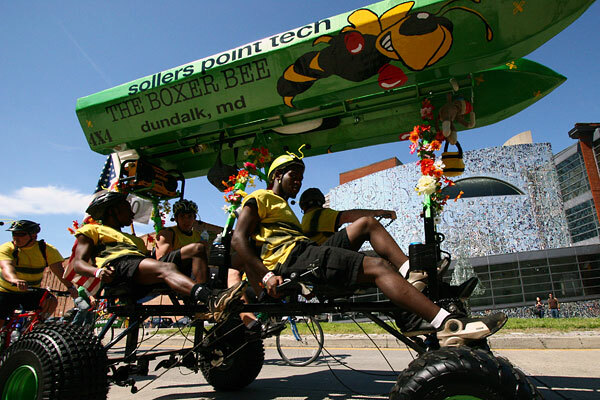 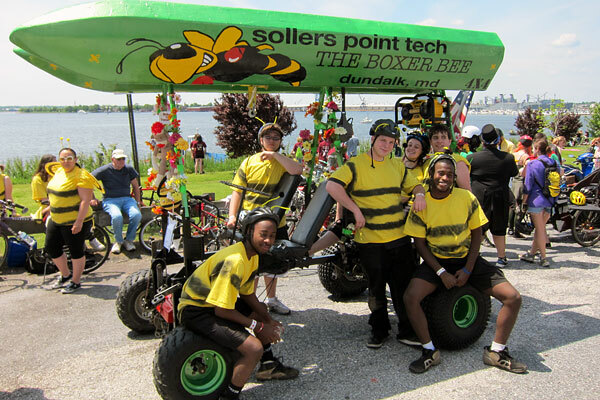 Sollers Point Technical High School 2010’s robust Heavy Metal rebuilt as Boxer Bee—a bee with boxing gloves. 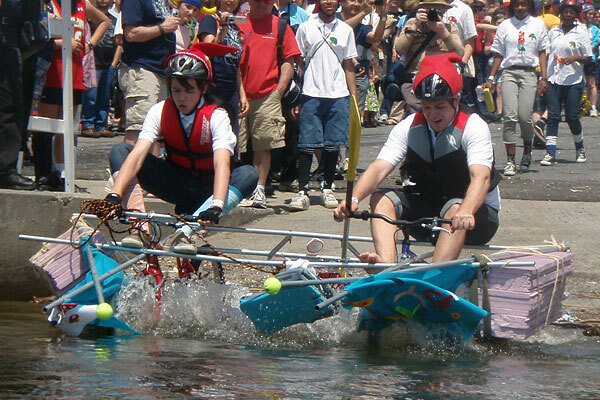 With a new rack and pinion steering system and disc brakes to complement their impressive swivelling pontoon mechanism, their shop-fabricated engineering was first class. 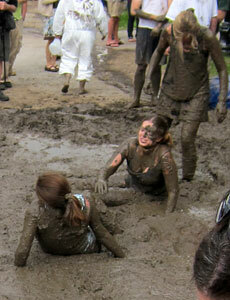 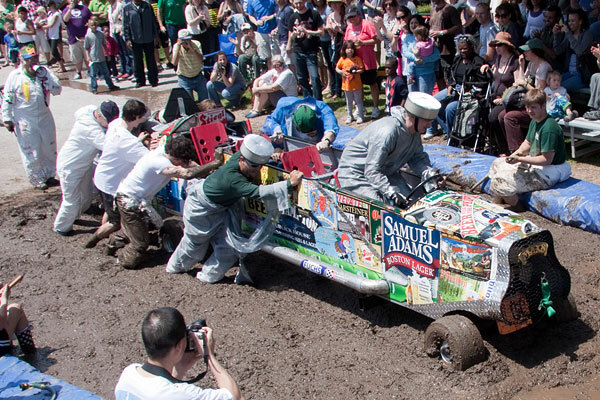 Even with broad tires, the combined toil of pit crew and pilots was needed to traverse the mud. 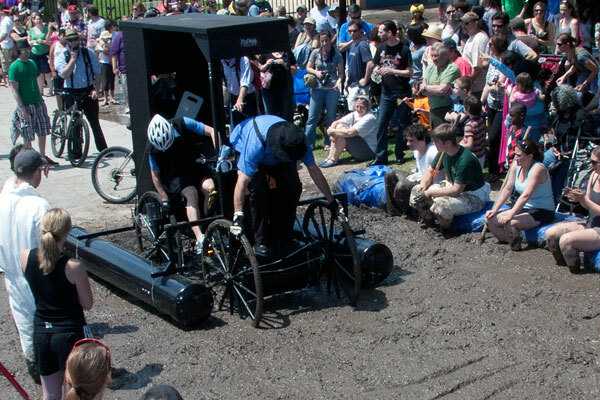 Tragically, their axle broke near the end of the race (not pictured). 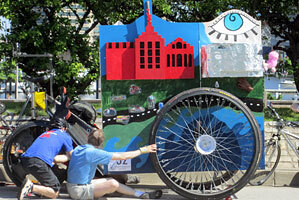 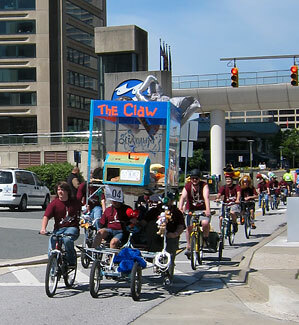 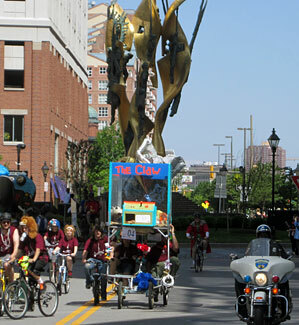 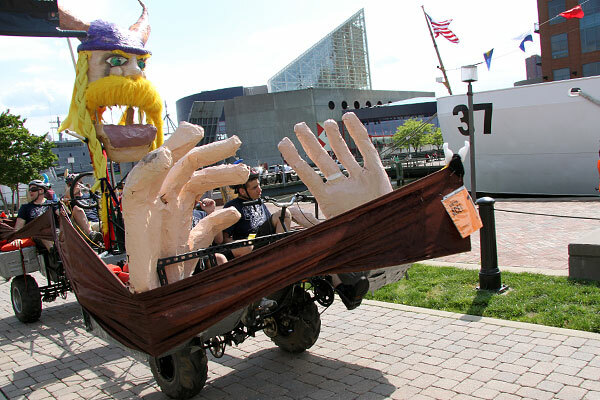 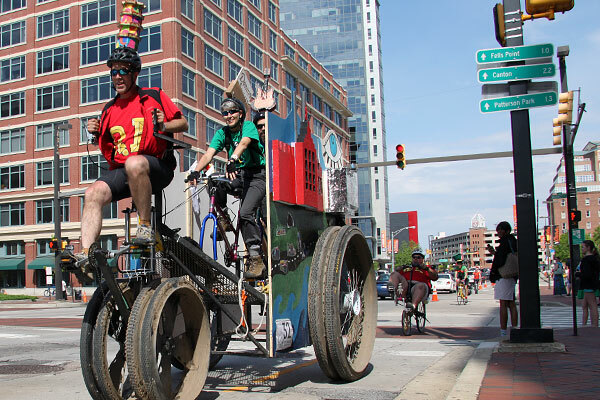 Jumbo tricycle Itty Bitty Charm City celebrates the route taken by the Sculpture Race through Baltimore. 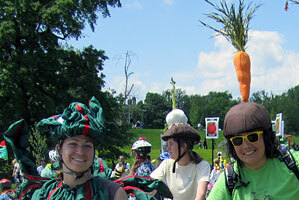 Pilots’ helmets bore likenesses of the Patterson Park Pagoda, the Domino Sugar factory logo, and the Power Plant guitar. 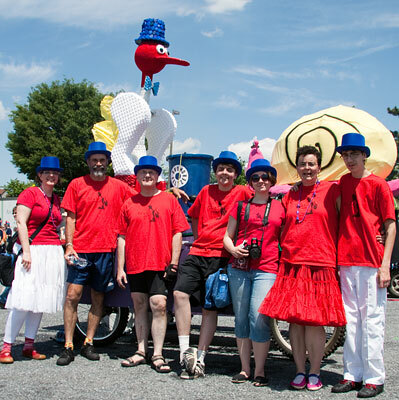 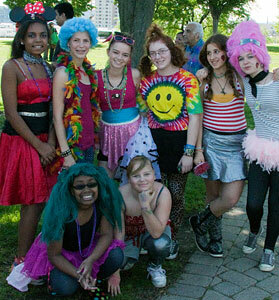 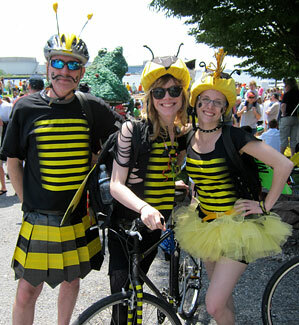 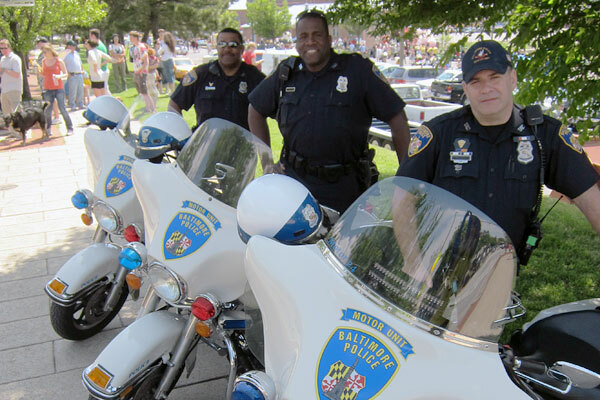 Given this metropolitan enthusism in a team originating from Rockville, they were awarded the Judges’ Discretionary Spirit of Baltimore Award. 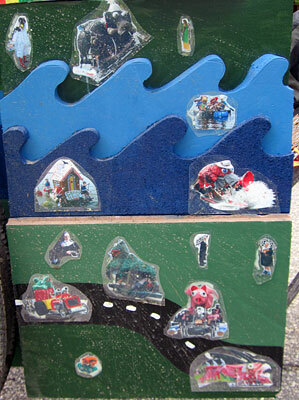 Among the waves and roadway on the side of Itty Bitty Charm City were photos of past years’ sculptures on the respective terrains. 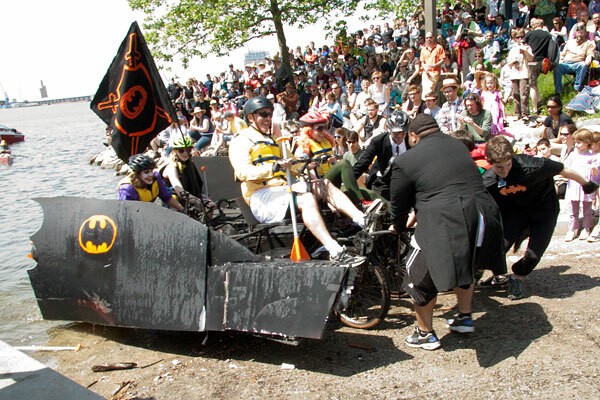 This is the same team that won the 2008 Championship with Rat Rod. 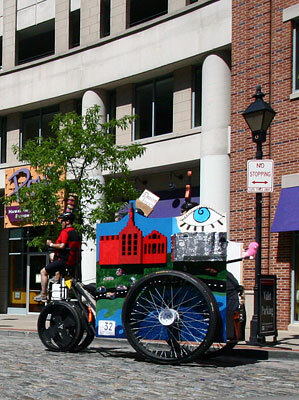 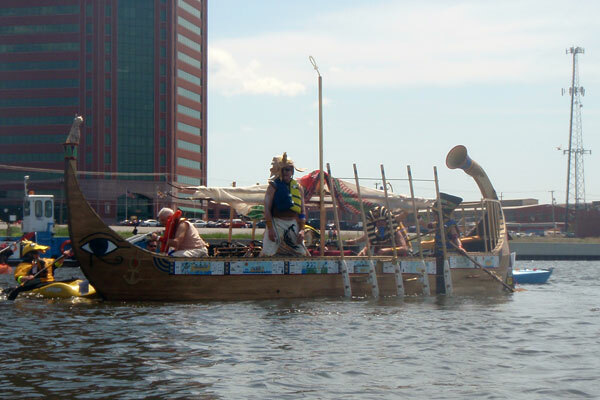 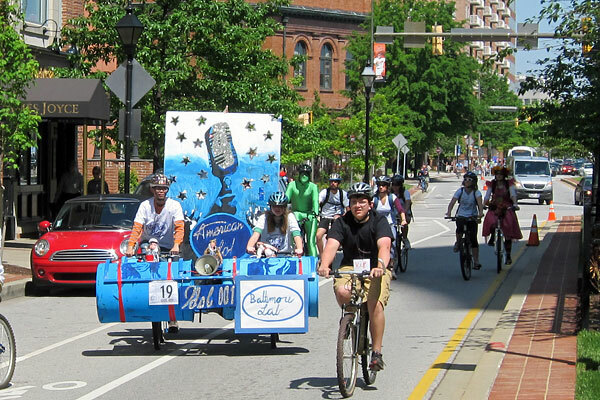 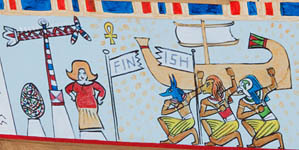 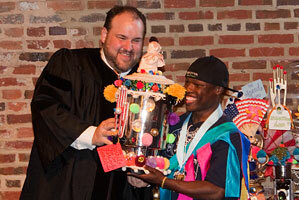 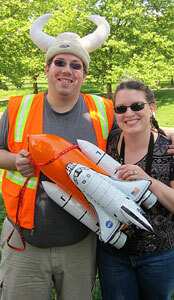 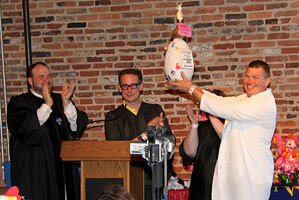 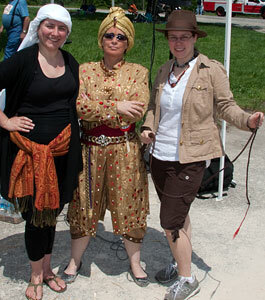 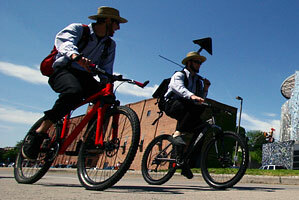 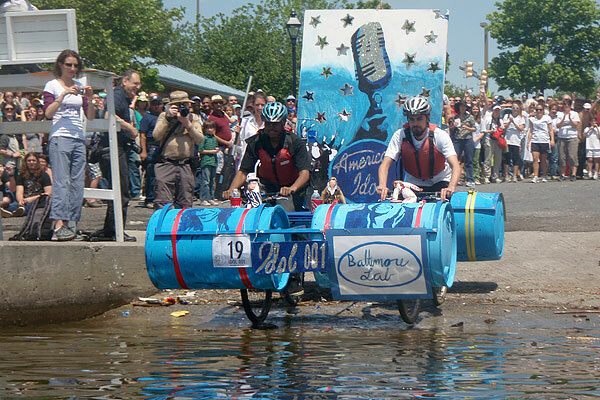 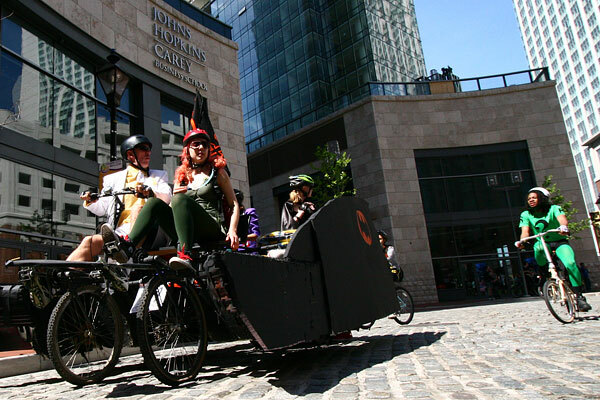 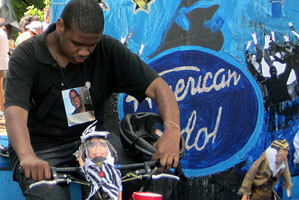 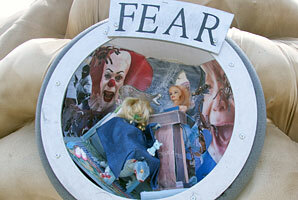 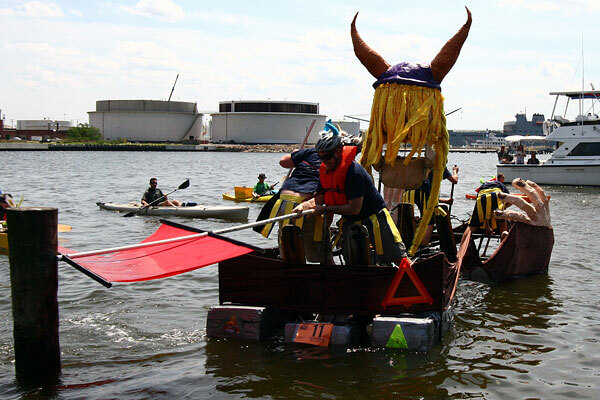 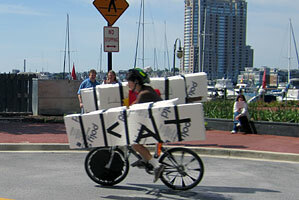 The Baltimore Lab School brought Idol 001, where Simon, Randy, and Paula raced through the city seeking an Idol. 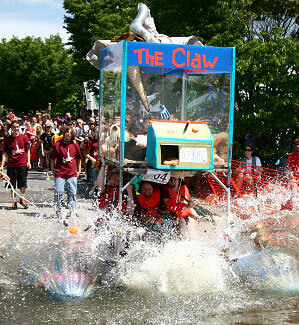 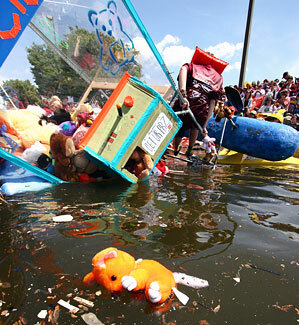 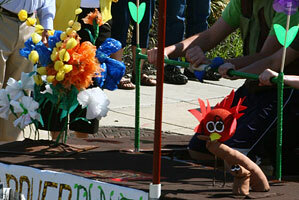 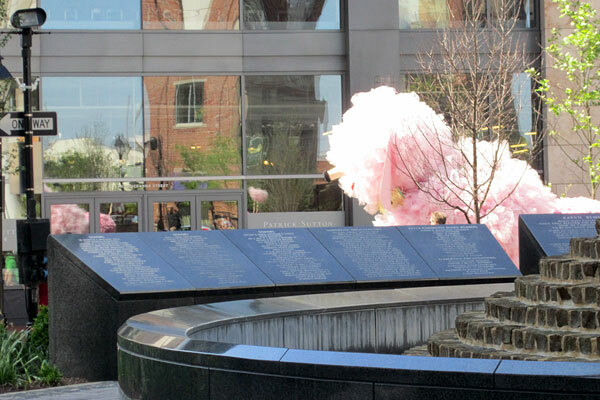 Their sturdy sculpture made a big splash. 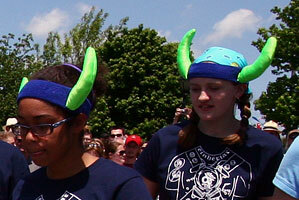 They presented a dance routine just before the water entry. 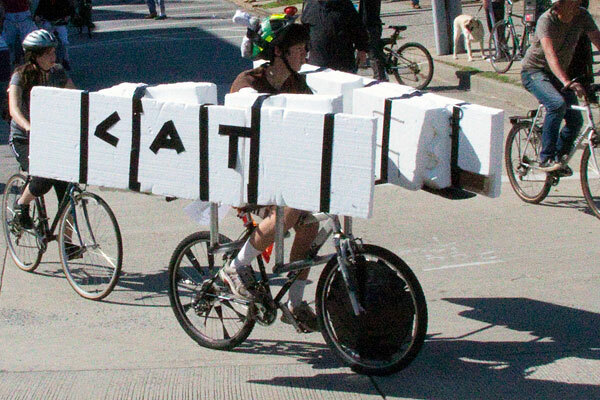 Skyler Lemkuhl of Philadelphia, of the Dumpster Divers, brought Cat-amaran. 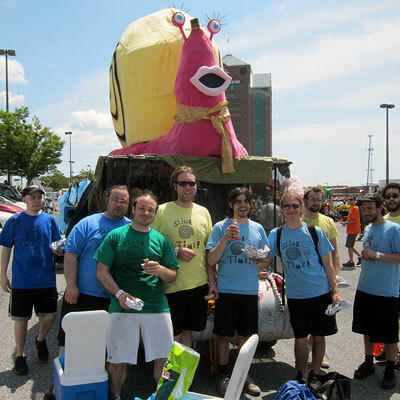 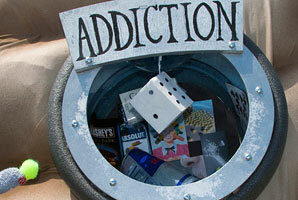 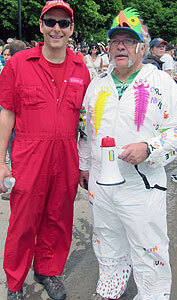 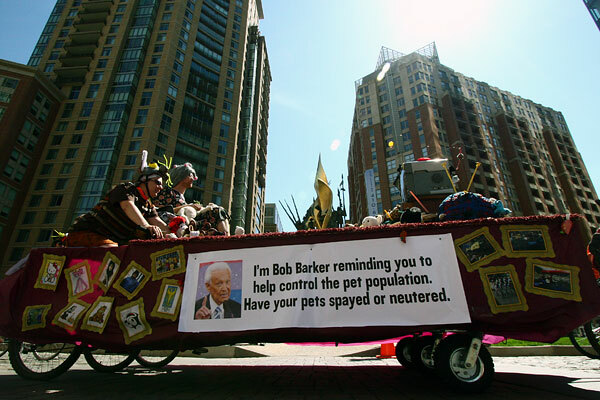 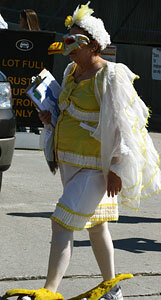 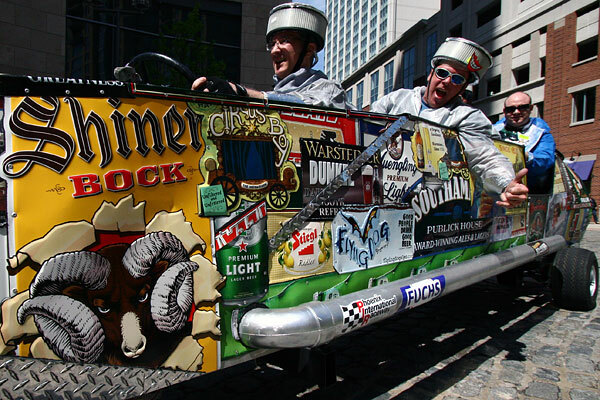 The Dumpster Divers have been in every Baltimore race—since 1999! 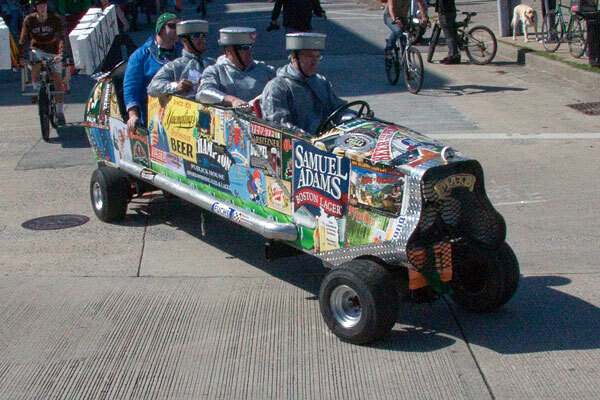 This unembellished design crossed the finished line first and handily won the Speed Award. 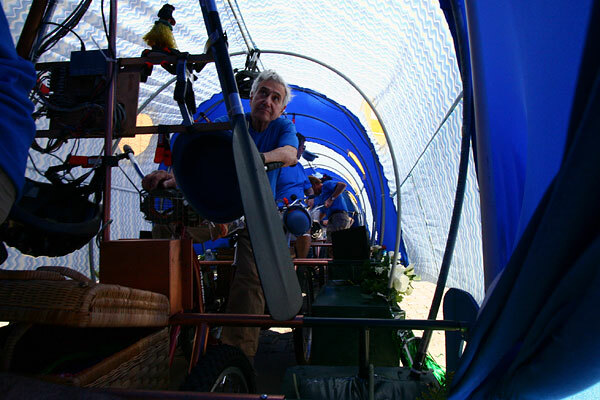 Tom Jones: Creator of Fine Websites, Maps, Spectator’s Guides, and other Paraphernalia to the Kinetic Trades, and Kinetic Seer #746 ordained by the Glorious Founder, Hobart Brown.